Own Our Girl - Pilot EpisodeDVD from Deff, DVD, Blu-Ray & 4K Video Specialists - Free UK Delivery..
What happens when a young woman is dispatched to an Army base in Afghanistan, swiftly becoming the target of insurgent bullets? And what happens when everything she thought she knew about herself is tested thousands of miles from home? Our Girl finds Molly Dawes (Lacey Turner) leaving the world she knew behind her and taking on the challenge of serving as an army medic in Afghanistan. Thrilled to find herself out of the ordinary and on .. 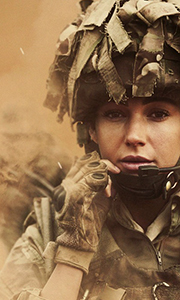 In this powerful second series of 'Our Girl', Michelle Keegan is Georgie Lane, a Stockport-born army medic with Two Section, a company still under the watchful eye of Captain James (Ben Aldridge), now posted to Kenya. Georgie takes on a vital role overseas serving at a refugee camp on the border of Somalia. When an IED explodes and an aid worker is kidnapped, Georgie becomes enmeshed in a dangerous situation and finds more than her own ..
Own Our Girl Series 3 DVD from Deff, DVD, Blu-Ray & 4K Video Specialists - Free UK Delivery..
Own Our Girl Series 1 to 3 DVD from Deff, DVD, Blu-Ray & 4K Video Specialists - Free UK Delivery..
Own Our Girl Series Three DVD from Deff, DVD, Blu-Ray & 4K Video Specialists - Free UK Delivery..